4.1. 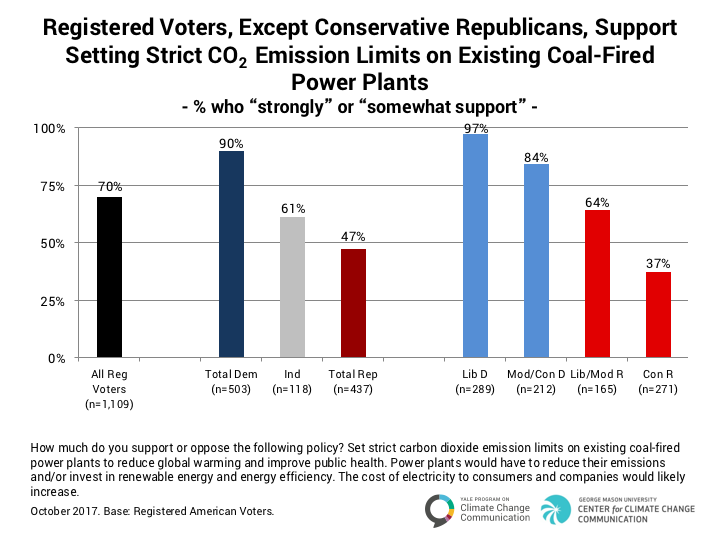 Registered voters, except conservative Republicans, support setting strict carbon dioxide emission limits on coal-fired power plants. Seven in ten registered voters (70%) support setting strict carbon dioxide emission limits on existing coal-fired power plants to reduce global warming and improve public health, even if the cost of electricity to consumers and companies would likely increase. A majority of Democrats (90%) and Independents (61%) support setting strict limits. Fewer than four in ten (37%) conservative Republicans support such limits. 4.2. 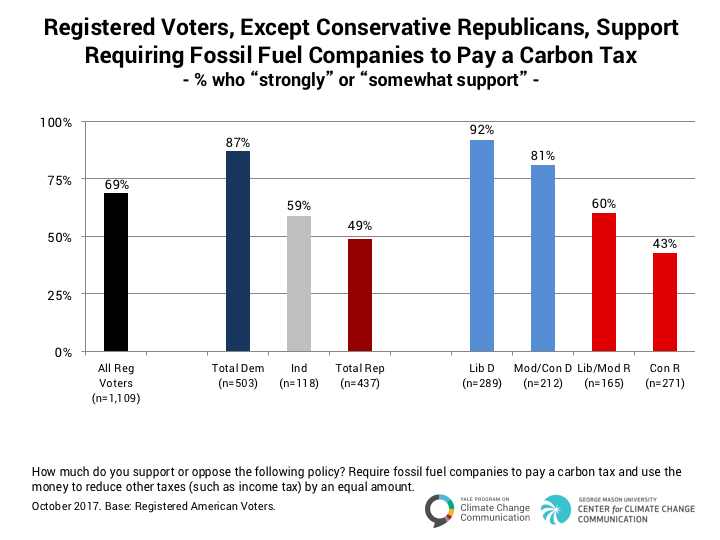 Registered voters, except conservative Republicans, support requiring fossil fuel companies to pay a carbon tax. A large majority of Democrats (87%), about six in ten Independents (59%), and six in ten liberal/moderate Republicans (60%) support a revenue-neutral carbon tax. About four in ten conservative Republicans (43%) support such a tax. 4.3. 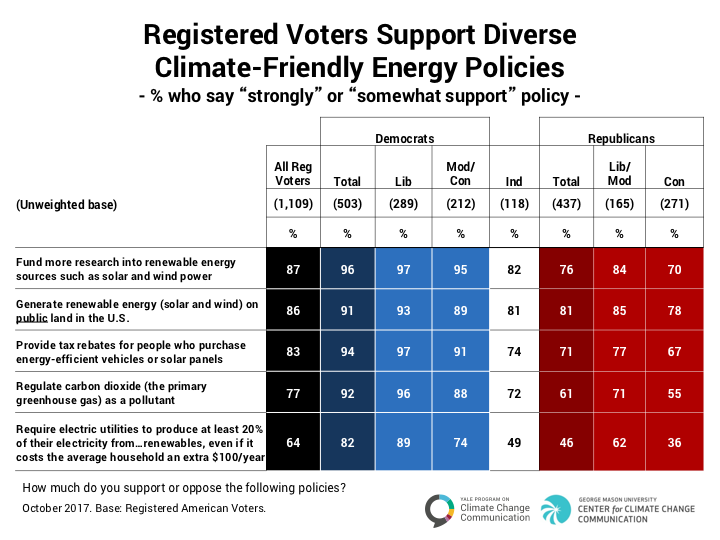 Registered voters support diverse climate-friendly energy policies. Funding more research into renewable energy sources: 87% of registered voters, 96% of Democrats, 82% of Independents, and 76% of Republicans. Generating renewable energy on public land in the United States: 86% of registered voters, 91% of Democrats, 81% of Independents, and 81% of Republicans. Providing tax rebates to people who purchase energy-efficient vehicles or solar panels: 83% of registered voters, 94% of Democrats, 74% of Independents, and 71% of Republicans. Regulating carbon dioxide as a pollutant: 77% of registered voters, 92% of Democrats, 72% of Independents, and 61% of Republicans. Majorities of conservative Republicans support funding more research into renewable energy (70%), generating renewable energy on public lands (78%), providing tax rebates to people who purchase energy-efficient vehicles or solar panels (67%), and regulating carbon dioxide as a pollutant (55%). 4.4. 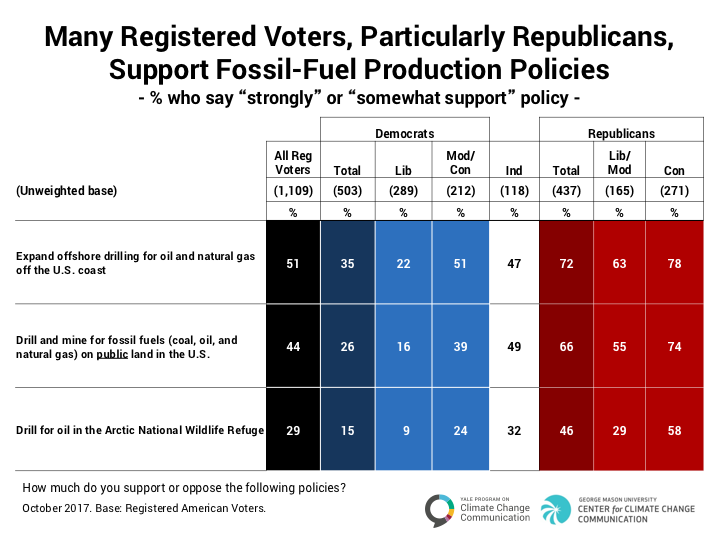 Many registered voters, particularly Republicans, support fossil-fuel production policies. Half of registered voters (51%) support expanding offshore drilling for oil and natural gas off the U.S. coast, including 72% of Republicans, 47% of Independents, and 35% of Democrats. Fewer registered voters (44%) support drilling and mining for fossil fuels on public land in the U.S., including 66% of Republicans and 49% of Independents, but only 26% of Democrats. By contrast, fewer registered voters (29%) support drilling for oil in Alaska’s Arctic National Wildlife Refuge (ANWR), while a large majority (69%) oppose it (see Data Tables). More than half of conservative Republicans (58%) support this policy, but liberal/moderate Republicans (29%), Independents (32%), and Democrats (15%) are much less likely to support oil drilling in ANWR. 4.5. 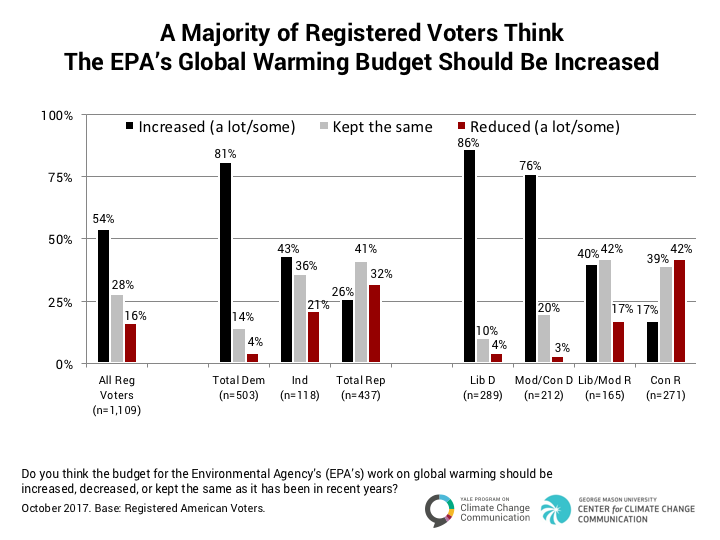 A majority of registered voters think the EPA’s global warming budget should be increased. More than eight in ten registered voters think the budget for the Environmental Protection Agency’s work on global warming should be increased (54%) or kept the same (28%). Only 16% of registered voters think the budget should be reduced. Nearly all Democrats think the EPA’s global warming budget should either be increased (81%) or kept the same (14%), as do almost eight in ten Independents (increased = 43%; kept the same = 36%). Two in three Republicans think the EPA’s global warming budget should either be increased (26%) or kept the same (41%), including a majority of conservative Republicans who think the EPA’s global warming budget should either be increased (17%) or kept the same (39%). 4.6. 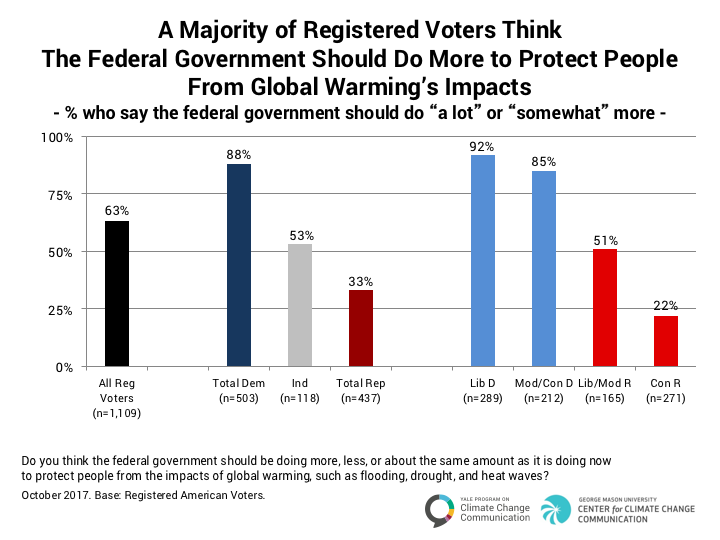 A majority of registered voters think the federal government should do more to protect people from global warming’s impacts. A solid majority of registered voters (63%) think the federal government should be doing more to protect people from the impacts of global warming, such as flooding, drought, and heat waves. This includes nearly nine in ten Democrats (88%), about half of Independents (53%), and one in three Republicans (33%). 4.7. 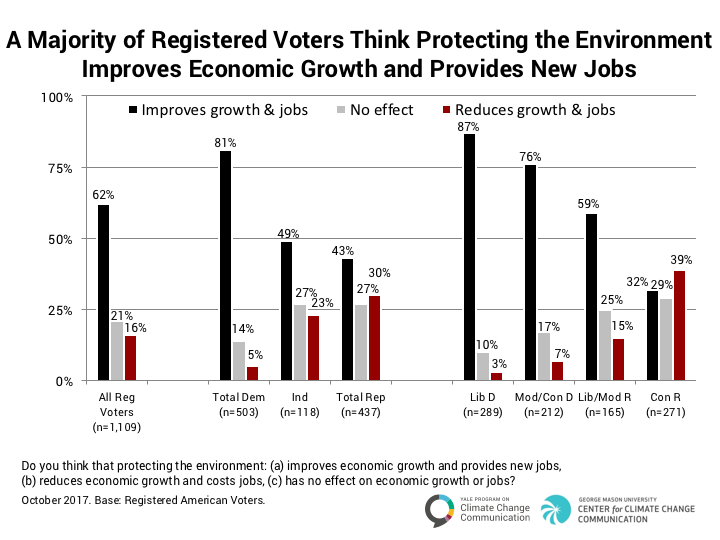 A majority of registered voters think protecting the environment improves economic growth and provides new jobs. A solid majority of registered voters (62%) think protecting the environment improves economic growth and provides new jobs. An additional 21% think protecting the environment has no effect on economic growth or jobs. By contrast, only 16% think protecting the environment reduces growth and costs jobs. Democrats are the most likely to think that protecting the environment improves growth and jobs (81%). About half of Independents (49%) and four in ten Republicans (43%, including 59% of liberal/moderate Republicans) also agree. Conservative Republicans are the only political group more likely to think protecting the environment reduces growth and jobs (39%) versus improves it (32%). 4.8. 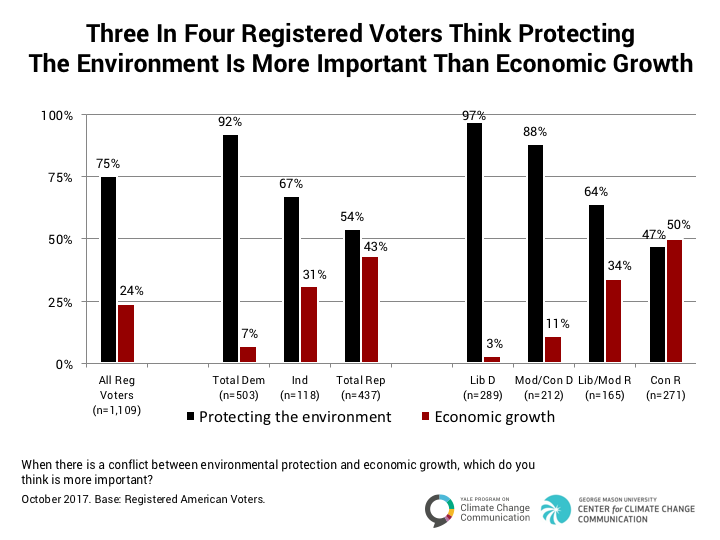 Three in four registered voters think protecting the environment is more important than economic growth. When there is a conflict between environmental protection and economic growth, 75% of registered voters think environmental protection is more important. This is true across most of the political spectrum, with nine in ten Democrats (92%), two in three Independents (67%), and more than half of Republicans (54%, 64% of liberal/moderate Republicans) in agreement. Only conservative Republicans are split – half (50%) think economic growth is more important while slightly fewer (47%) think environmental protection is more important. 4.9. 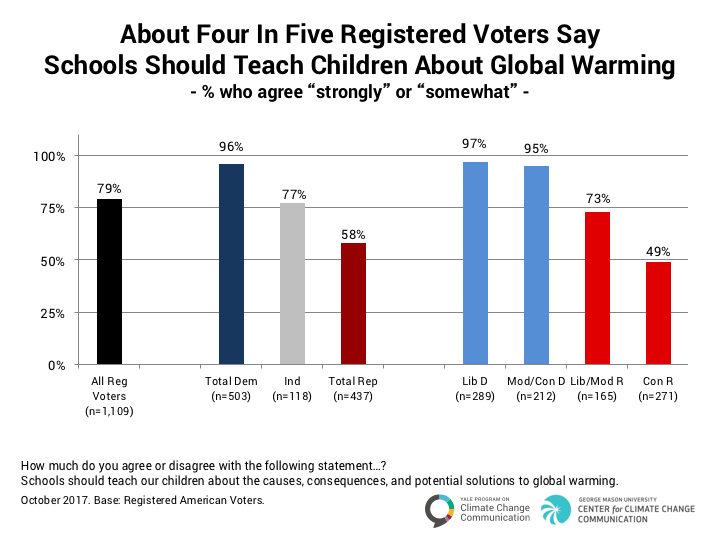 About four in five registered voters say schools should teach children about global warming. The Next Generation Science Standards for K-12 STEM (Science, Technology, Engineering, and Mathematics) education in the United StatesThe Next Generation Science Standards were developed by a collaboration of scientists and educators at the National Research Council of the National Academy of Sciences; the American Academy for the Advancement of Science; the National Teacher’s Association; 26 states; and Achieve (a non-profit organization). Released in 2013, the standards represent the most current, research-based method of educating K-12 students in STEM and preparing them for STEM careers. See: http://www.nextgenscience.org/ require that climate change be included in the curriculum, a mandate that is controversial in some parts of the country. A large majority of registered voters (79%) support schools teaching children about the causes, consequences, and potential solutions to global warming. Support largely spans the political spectrum with nearly all Democrats (96%), about three in four Independents (77%), and a majority of Republicans (58%, 73% of liberal/moderate Republicans) saying they support teaching about global warming. Only conservative Republicans are split, with 49% supporting teaching about global warming in schools and 50% opposing it.